If you’ve had your eye on the 2020 Designs blog, you’ve probably already heard us say it: we’re big believers in the power of a professional web presence. And it’s not just because digital design is our bread and butter. A professional digital footprint can bolster your business and even increase your current patients’ confidence. In fact, recent data shows that more than 75% of people rely on web searches in order to find professional medical services. Clearly, an online presence is the 21st century equivalent of a well-hung shingle. 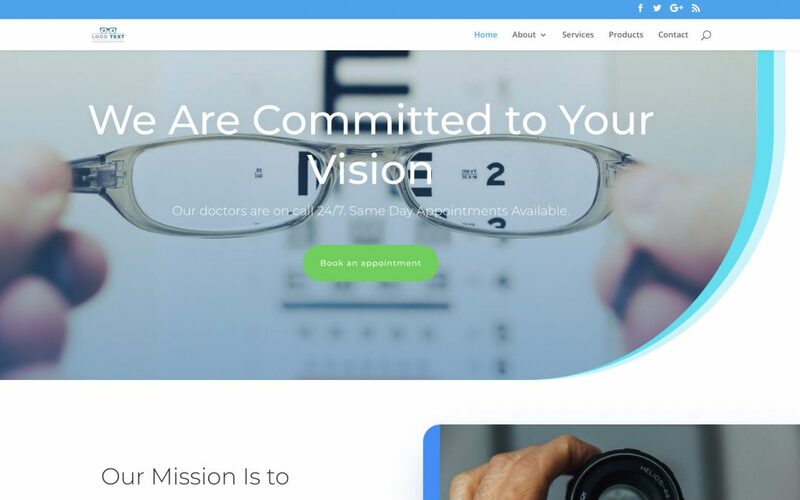 But once you’ve realized the importance of having a website for your practice, you’re faced with another conundrum: where, exactly, do you go to get a new optometry website? You’ve got a few different options. Ready to bring your practice into the digital domain? Here are some common ways to build a new website. Mark Zuckerberg’s hivemind spares just about nobody these days, and putting your business into the mix is a good way to score some extra attention. Optometry practices with social media presences cut a youthful (dare we say hip?) figure, making them stand out from the competition. Plus, a Facebook business page is quick and easy to set up, and you can do it yourself — for free, no less. But although a Facebook page is a great start toward carving out a digital footprint, it’s no replacement for an actual website, where you’ll have total control over your content, UI, and format. We recommend creating a social media presence to all our clients — but in addition to a website, not instead of one! When you’re hemmed in by a third-party platform’s format, there’s only so much functionality you can hope for. And besides, should the site ever go down — yes, it’s possible, even for a giant like Facebook — well, there goes all your content along with it. Great exposure across demographics — just about everybody’s on Facebook these days. Companies like Wix and Weebly offer comprehensive website-building software aimed at beginners, and platforms like WordPress offer highly customizable tools, creating sliding scale of build complexity depending on your skillset. In most cases, you can start with a free site, which will include the platform’s name in the domain, or upgrade to an affordable “premium” plan of some sort, which will allow you to put in your own domain name (i.e., www.yourpractice.com). But if you’re not a professional web developer, chances are, you’re not going to make a professional-looking website — not to mention the less-visible, but vitally important, factor of SEO implementation. Your patients know they can’t diagnose their own eyeballs, which is why they turn to you, a professional, to get the services they need. And another way to get a new optometry website is to take a page out of their book and do the same: hire a professional web developer. By hiring a professional, you can skip all the time-intensive footwork — you’re paying for someone else’s knowledge, so you don’t have to develop your own. That said, you’re likely to pay quite dearly, especially if you commission the project to a big, well-known firm. And since these companies usually have many different departments and employees all working on your website, there’s likely to be a lot of back-and-forth before you have your final product. Okay, okay, we’re obviously a little biased. But when you hire a mom-and-pop web design firm like us, you get all the customization and control of hiring a web developer at affordable prices — and we’ll also make those critical design decisions for you, taking one more task off your plate. We here at 2020 Designs aren’t a major web development firm… which is actually a good thing. We’re just two digital professionals with the coding, design, and content marketing chops you need to make an optometry website that’ll soar. Our process is super quick and mostly hands-off on your part; we just hop on a call to learn more about what you’re looking for and then cook up your site in two weeks flat. Our prices are fair, affordable, and most importantly straightforward: we list them right on the website, rather than making you go through a lengthy ordeal to get a quote. We’d come up with a cons list, but honestly, it’d be disingenuous. We’re definitely not perfect, but as far as building optometry websites goes, we have to say we’re a pretty great choice. So — ready to get started on building your own practice’s website with the least amount of expense and hassle? Go ahead and give us a shout. We can’t wait to hear from you!